Need to put up a new bulletin board for winter? These plans may be just what you need. Celebrate the Winter Olympics or just winter in general. Your board will be unique! Editable captions, cutouts that may be resized as desired, a list of materials, and instructions are included. 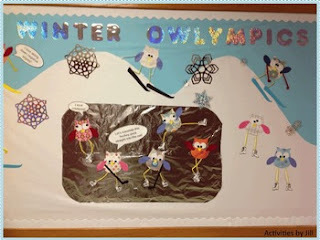 I used a combination of these free clipart owls from Classroom Compulsion FREE Owl Template by Classroom Compulsion and my own $2.00 Winter Sport Owls Collection. I teach secondary mathematics so I created captions related to slope and transformations. The PowerPoint included in this download contains those captions, but is editable to allow you to create captions of your own. Also included are ski, goggle, hockey stick, and puck patterns. You should be able to create a bulletin board of any size using the materials listed in the instructions and those included in this download. Students would enjoy helping to cut out and assemble the materials!